How to Become a Court Reporter in Pennsylvania? How Much Do Court Reporters Earn in Pennsylvania? Any one employed or contracted to make the court record for use in any Pennsylvania court. In short, a court reporter makes the legal record of court proceedings by transcribing what is being said into written text. This is done with high proficiency and accuracy. Once the proceedings have concluded, the court reporter in compliance with rules governing transcript production in Pennsylvania produces a transcript of the proceedings within a specified time mandated by the Supreme Court of Pennsylvania. If you are interested in pursuing this profession and would like to know how to become a court reporter in Pennsylvania then read the following information carefully. Creating a word-for-word transcript of official legal proceedings with accuracy and speed is a skill, which can be learned through proper training. This is why it is recommended that you enroll yourself in a court reporting program in your nearest community college or technical school. The National Court Reporters Association (NCRA), one of the main certifying bodies of court reporters in the US, approves only two court reporting programs in the state of Pennsylvania. Court reporting programs in Pennsylvania are offered both at non-degree (certificate) and degree level (Associate of Science). The former can be completed earlier than the latter but lacks depth and comprehensiveness. An Associate of Science degree in Court Reporting, however, will let you take courses in humanities, literature, social sciences, and history, in addition to core courses in court reporting. You may complete this degree in 2 years with full-time enrollment. Getting certified in a competitive field like court reporting not only increases your chances of getting hired but may also get you a better salary package. To get certified, you may contact a national organization like the NCRA. This organization offers the Registered Professional Reporter (RPR) Certification. It is worth reminding you here that your certification is not for life and will expire after three years unless you complete 30 hours of continuing professional education to renew your certificate. 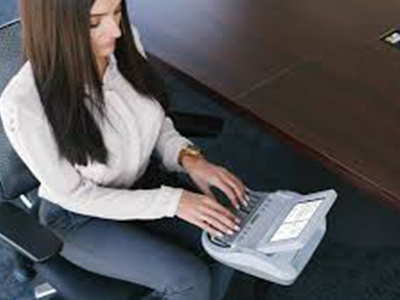 Once you are certified, it is time to look for a court reporter’s job. Joining the Pennsylvania Court Reporters Association (PCRA) is one of the best ways to get hired in the state. The association’s official website contains an updated list of vacancies, which you can make use of. Furthermore, the PCRA organizes meet and greet sessions for its old and new members where you can network with senior court reporters and get a firsthand view of the profession. Pennsylvania is the fourth biggest state in the US which employs court reporters with Pittsburgh having the biggest concentration of court reporters. Pennsylvania is only behind Texas, New York and Florida in employment of court reporters. O*NET OnLine predicts 5% job growth in this field in Pennsylvania from 2016 to 2026. Since the growth rate is moderate, therefore expect a stiff competition when applying for a job. However, you can increase your chances of getting hired and quickly by pursuing an associate degree in court reporting instead of a certificate and by getting certified by NCRA or one of the other national certifying bodies.